These bicycles are part of the Zagster bike-share program, which had designated bike racks at McKelvey Park and UTRGV. 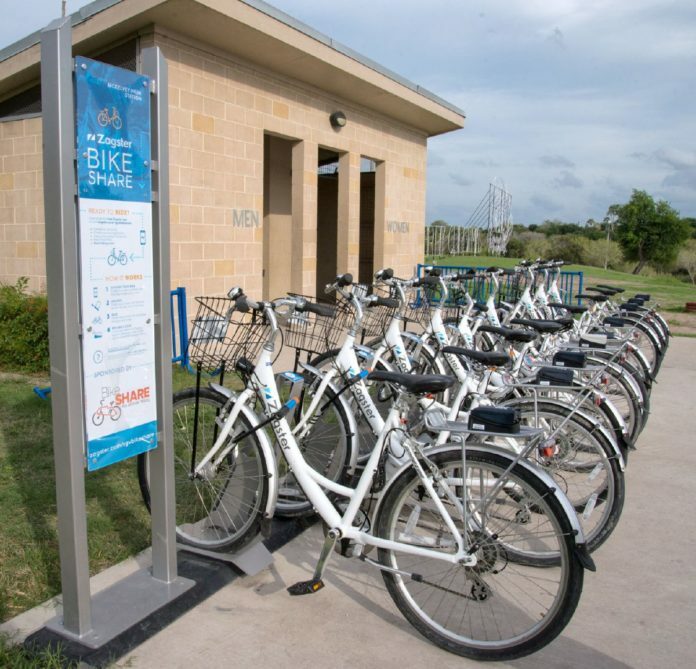 WESLACO — BikeShare RGV, the Valley-wide dockless bicycle system that isn’t going to cost cities and towns a cent to deploy, is tentatively set for a Nov. 9 unveiling, officials with the Lower Rio Grande Valley Development Council said. The council’s board this past week was updated by Executive Director Ron Garza about the plan, which will in effect supersede bike-share programs which exist or did exist in several cities, including Harlingen. The bike-share company Lime will provide the bikes to any city or town that wants to join in, with the only requirement being that each pass an ordinance that will set rules of the road for both cities and Lime. The dockless bike-share system operates by having users download a phone app, signing up with a debit or credit card, and using the app to unlock a bike for a ride. The bikes are not destined to be in a single spot — there are no racks — but can be left in general areas when riders are finished. Generally the cost is about $1 per hour and the location of bikes is monitored using GPS. But first the right municipal ordinance has to be constructed, and Harlingen city officials have generously volunteered to come up with one which can be used by all 43 cities and towns within the LRGVDC area, Garza said. Harlingen City Manager Dan Serna said city officials are nearly finished with a draft form of the ordinance, and it should be ready to present to the city commission at its Oct. 17 meeting. Serna said the priorities for the ordinance and the new bike-share partnership are that it is no-cost and it allows interconnected transportation between Valley cities, as long as those cities and towns sign up for the program, too. Serna said he thinks the dockless concept will be a better fit than the city’s Zagster bike-share program with its designated bike racks at UTRGV and McKelvey Park. That program lasted from August 2016 until last month when the contract expired and was not renewed given the likelihood the Lime bike-share would be adopted. Garza said he has a preliminary list of municipalities which are eager to sign up for the Lime bike-share. Cities without experience in bike-share programs may want to delay committing now, and Garza said that’s perfectly acceptable. “If a city wants to play the wait-and-see game, they can adopt it three or six months down the road, you’re free to do that as well,” he said. The Zagster program in Harlingen cost $17,100 a year, with the first year covered by a grant from the University of Texas Health Science Center in Houston. The city paid the fee for the second year.